A remarkable tool for remarkable diagramming results. If your application targets the ActiveX platform and you need to implement diagramming features than all you need is FlowChartX. It provides all the functionality to create, customize and render a flowchart. The component gives you a set of more than 100 predefined node shapes including tables with unlimited number of rows and columns. You can define your own custom shapes or style any of the predefined nodes according to your needs. The connectors can be built of numerous segments, which can be straight lines or curves. You can apply various decoration on the diagram elements such as frames, lane divider lines and many more. Eachnode can hold both images and text, the text alignment could be changed. Nodes support shadows and can be transparent or semi-transparent. All fonts and colors are customizable and you can define your own mouse cursors. The Z-order of the nodes can be changed. At your disposal is also a rich choice of pen and brush styles. You can arrange even the most complicated and big diagrams in an easy-to-understand manner by applying one of the automatic layout algorithms. FlowChartX offers you many to choose from - radial, directional, grid layout and 6 more. Each one is applied with a mouse click and has various customization properties, which help you achieve exactly the look you need. You can lock selected diagram elements or the whole diagram by using the read-only mode. 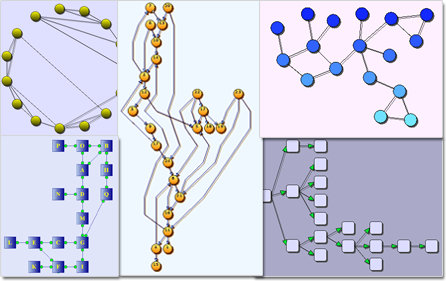 If you want to build a hierarchy, you can create nodes that can be expanded and collapsed. If you are building a database diagram or an ER chart, the scrollable tables will be of help. All nodes support in-place editing. If you move them their connectors can be positioned dynamically relative to the nodes that they link. 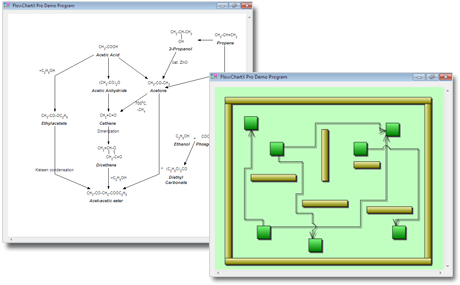 "FlowChartX has enabled us to provide comprehensive graphical diagramming facilities to our product, thus significantly enhancing the visualisation capabilities and making our software much easier to use. Mindfusion’s support has been outstanding and their products are reliable and work well. They respond very quickly to support queries and have implemented several enhancements for us in a matter of days. I would recommend them without hesitation."